It’s dragonfly season here at the Arboretum. Technically dragonflies are here all year, but you can see the greatest diversity of species in the brutal summer heat. Last Saturday we had a fabulous class on dragonflies taught by local expert Bob Honig. He pointed out at least a dozen species zipping over our new Woodway ponds. They are all courting and laying eggs, which quickly hatch into aquatic larvae called nymphs. 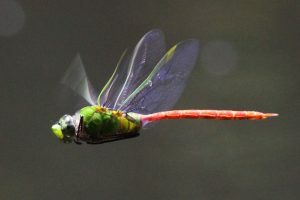 When nymphs are ready to become adults, they climb out of the water and shed their skin, emerging as the beautiful winged dragonflies we know and love. You can see hundreds of empty nymph shells on plants around the Woodway ponds if you look closely. 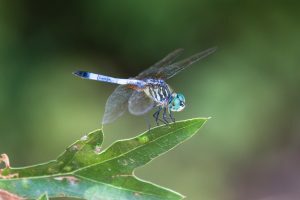 The most common dragonfly at the Arboretum is the Blue Dasher. These smallish dragonflies start out with yellow and black-striped bodies, but the males develop a blue “bloom” on their abdomens as they age. 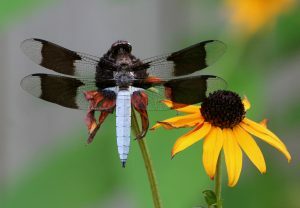 Our most striking summer dragonfly is probably the Common Whitetail. You may see them hunting quite far from water. 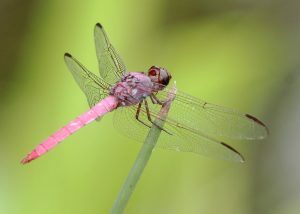 A staff favorite is the unreal-looking Roseate Skimmer. Females have an unusual adaptation: a scoop-like flap on their abdomens. A female will scoop up water and fling it forward as she lays eggs so they are scattered far and wide by the splash. 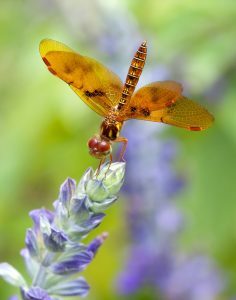 Eastern Amberwings are so small that you might mistake them for wasps. They hover close over the water, keeping out of reach of the larger dragonflies – they’d make a tasty lunch for their bigger cousins! We were lucky to see a more uncommon species called a Comet Darner on Saturday. These large dragonflies fly very fast over open water, rarely stopping to land. 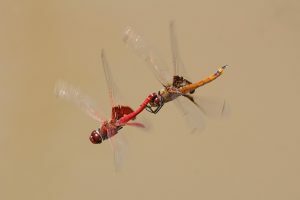 These Red Saddlebags are displaying typical dragonfly courtship behavior. The male grabs the female by her neck and guards her from other males. We saw all of these species and more on Saturday – which ones can you find?